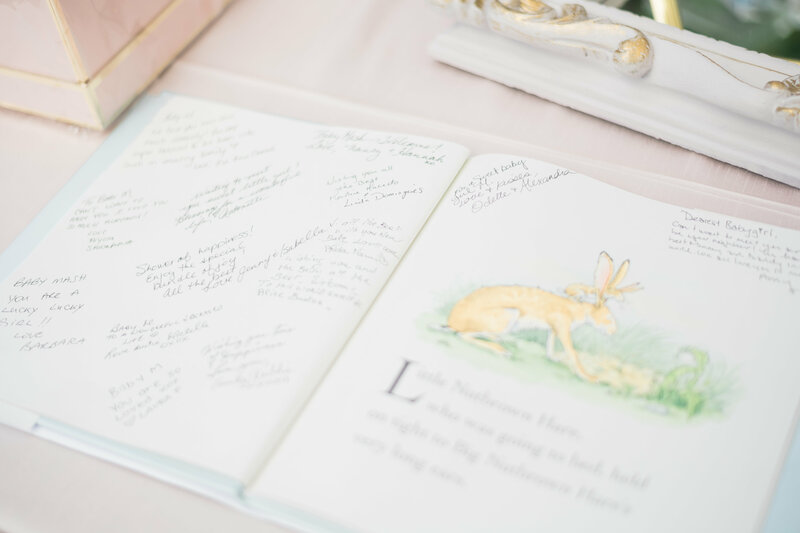 Just over 4 months ago we had the pleasure of not only planning this beautiful 'Pretty in Pink' baby shower but we were guests as well (yes it's possible and we wouldn't want it any other way!) for one of our past couples. It's such an honour when our clients continue to use us for all their parties and life milestones. Since Dayna & Jason knew that they were having a precious little girl, they wanted the shower to be very feminine and elegant. Our eyes smiled and the ideas started flowing, as we couldn't wait to bring their beautiful vision to life. 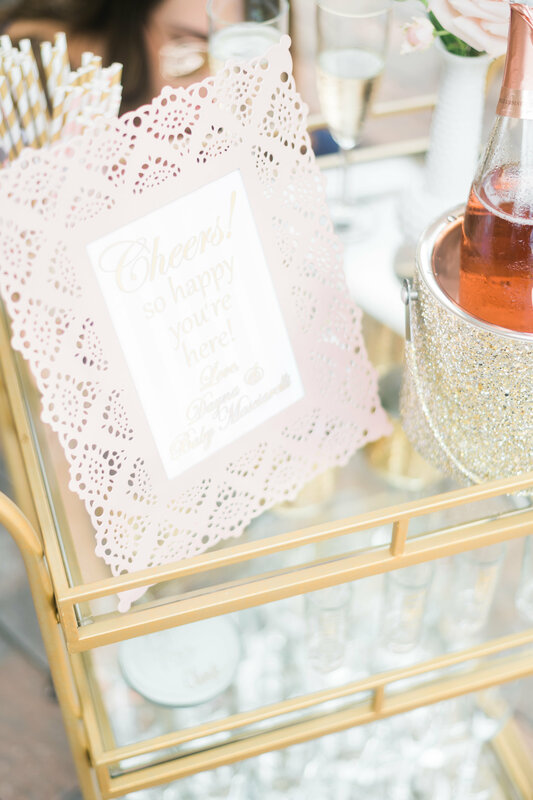 The colour scheme was blush, white and gold paired with a floral print that was included on many of the day of details; welcome sign, napkins, stationery games, favours and even the photo booth props - LITERALLY everything. 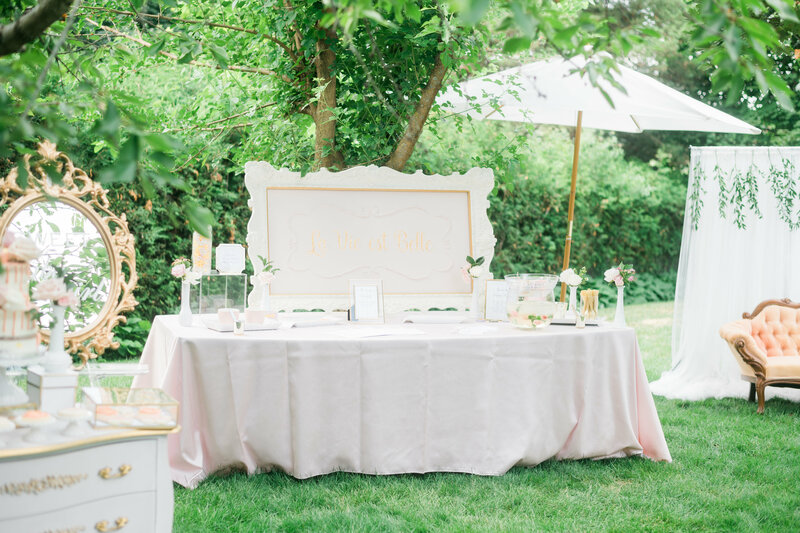 As guests entered the backyard, they were offered a pink lemonade mimosa displayed on our gold bar cart and were encouraged to play some of the games and sign the guestbook that was actually a classic kid's book, "Love you Forever". Some of the games included were "Guess The Baby Food", where guests were allowed to try and smell each flavour and guess the amount of pink jelly beans in the jar. The guests continued their way throughout the space to enjoy the photo booth. 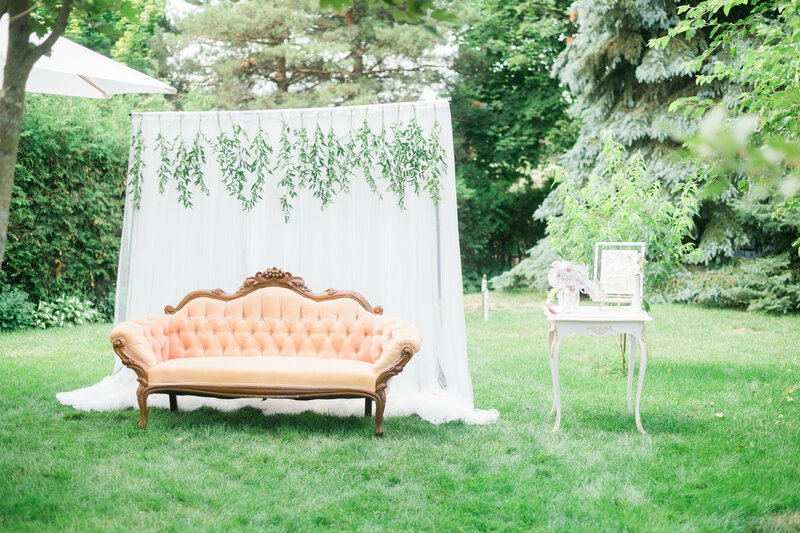 Flowerly created the beautiful tulle backdrop adorned with greeneryand the pink vintage couch and side table was provided by Cre8ive Studios. This space was later used to open gifts, which we suggested as it's always a great idea to re-purpose elements of an event AND it made for a perfect backdrop for photos. 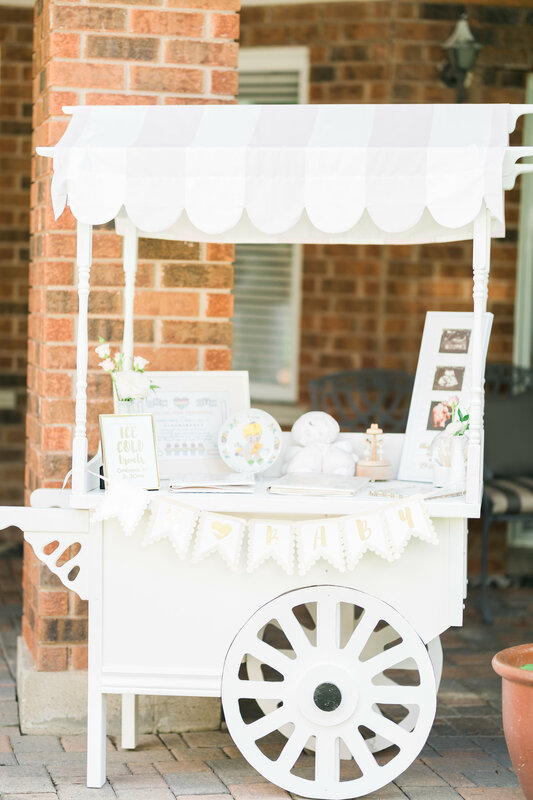 ‍Another added touch was all the personal elements brought in by the super crafty mama-to-be, from the baby memorabilia on the cart by Sweetheart Sugar Carts, to the baby clothes that were hung on the clothes line, and it even included the mama-to-be's snowsuit from when she was a baby. We made cute little onesies to add to this collection, that can later be worn by the baby and one of the favourites was "mamas bestie". 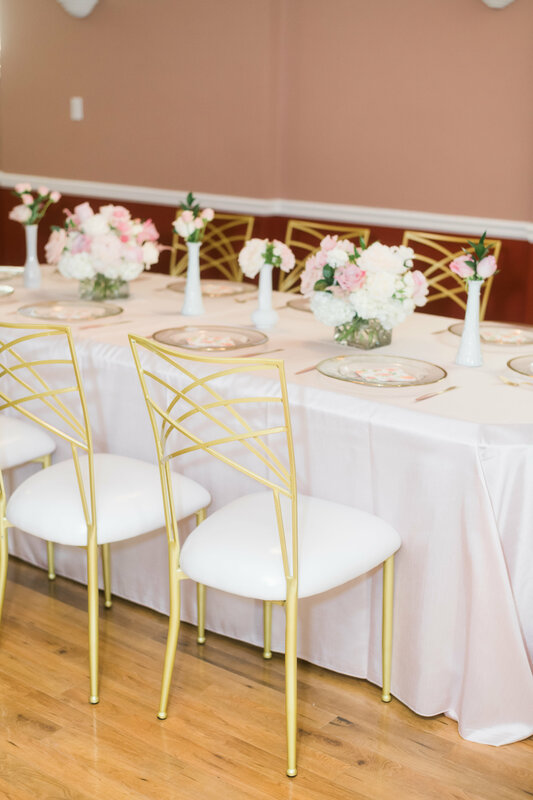 The guest tables were set up both inside and outside with beautiful raw silk blush linen by Susan Murray International, gorgeous floral centerpieces by Flowerly and paired with our elegant gold Florence chairs. Dayna wanted to create luxurious elements, so we added our toronto decor rentals of gold rim glass charger plates and blush and gold cutlery. A floral napkin was added on top to tie in the theme. Lastly, for the sweetest of all, the desserts! 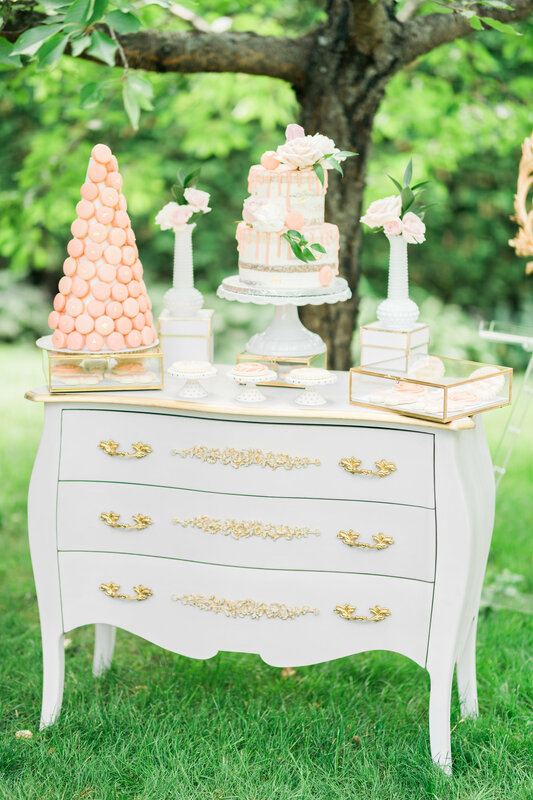 The sweet table was displayed on a gorgeous blush dresser from Cre8ive Studios that included a semi naked drip cake adorned with fresh floral, a macaroon tower with delicate gold detailing and custom cookies by the one and only Baking up Treble. Our elegant gold glass display boxes were the perfect touch to create a luxurious feel. That's not it though, remember the cart that was used for the baby memorabilia? 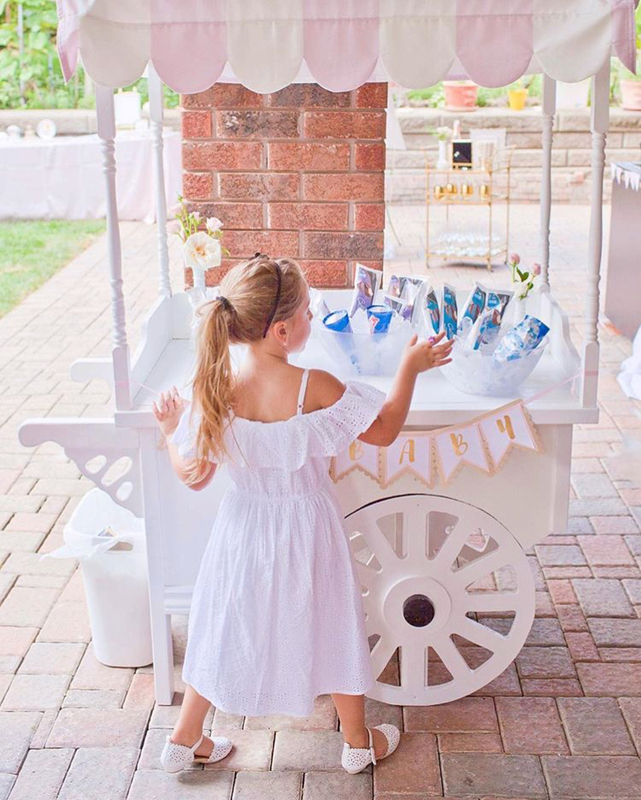 Yup, it was re-purposed and used for the ice cream station (great idea right? ), not only did the adults love this idea but the kids were all over it! 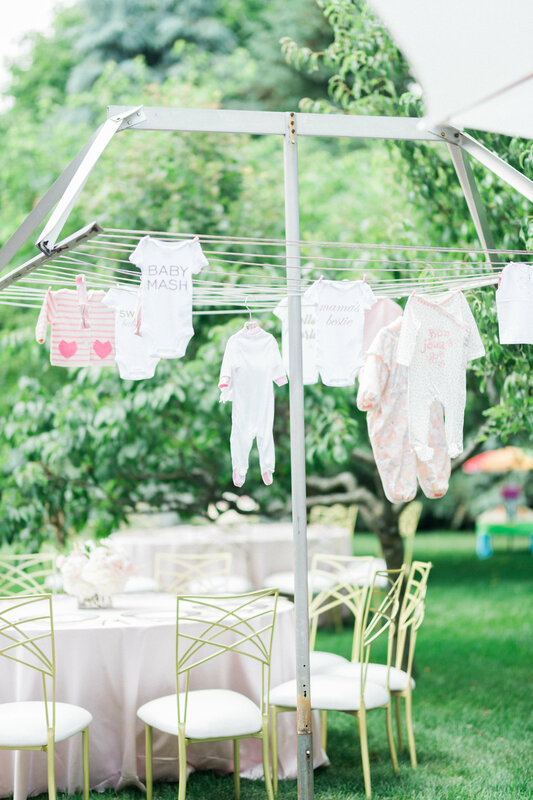 It was a gorgeous summer day celebrating a beautiful mama-to-be and we loved being part of this elegant baby shower from the planning, design to providing Toronto decor rentals. 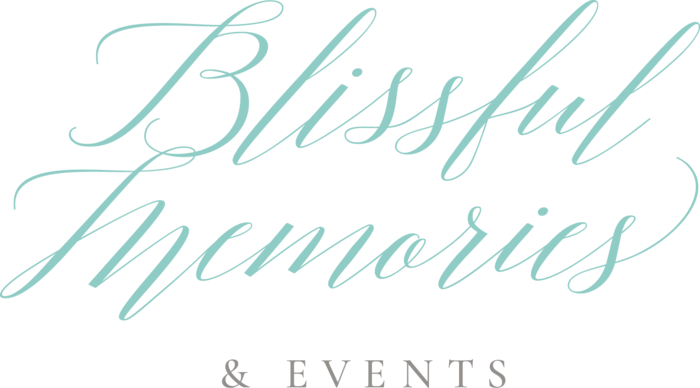 If you have any upcoming celebrations you need help with, get in touch as we love being part of our clients' blissful memories. Gift Boxes: Boxed By Co.